On Saturday, October 7th the WNC Nature Center will host their 41st annual Hey Day fall festival from 10am-4pm. The event includes fun for the whole family: live performances, music, games, crafts, special animal education moments, food vendors and more! Attendees will be entertained by the Mountain Thunder Cloggers, a science demonstration with the Asheville Museum of Science, Professor Whizzpop, Idea Factory, and musician Ben Wilson. Event activities include pumpkin painting sponsored by Ingles, a scavenger hunt, face painting, temporary tattoos, and exciting animal programs with furry and feathered ambassadors. Food will be available for purchase from Papa John’s Pizza, Prime Time Eats’ hot dog cart, and Kona Ice. Whole Foods will be hosting a free trail mix making activity for kids. Regular Nature Center admission rates apply; Friends members receive free admission. Additional event information available at wildwnc.org/event/hey-day-festival. The Friends of the WNC Nature Center appreciate the support and generosity of this year’s sponsors including: Festiva, The Biltmore, White Oak Financial, Carolina Alliance Bank, Asheville Bicycle Co., Asheville Savings Bank, BrickStreet Equity Management, REACH of Asheville, Landmark Landscapes, Charlotte Street Animal Hospital, Whole Foods, Ingles, Asheville Parks and Rec, Kona Ice, Papa John’s Pizza, and Prime Time Eats. 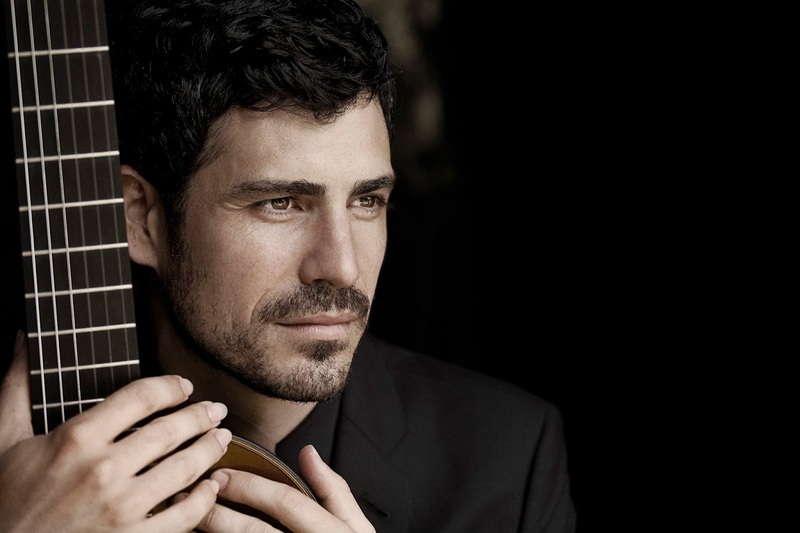 Praised as “the soul of the Spanish guitar,” Pablo Sáinz Villegas has become a worldwide sensation known as this generation’s great guitarist. With his “virtuosic playing characterized by irresistible exuberance” as described by The New York Times, his interpretations conjure the passion, playfulness, and drama of his homeland’s rich musical heritage. Villegas performs Tuesday, October 3 at 8:00 p.m. at the Diana Wortham Theatre in downtown Asheville. The guitar was brought by the Spaniards to the New World during the colonial period and Villegas takes audiences on a world journey that combines the emotions of sensual Brazilian music, the nostalgic tango, vivid Venezuelan rhythms, and even colorful American bluegrass. According to the San Francisco Classical Voice, Villegas’s playing is characterized by “subtlety, passion, technical command, and dramatic flair.” His combination of soul and skill have afforded him a place on some of the world’s most prestigious stages such as Carnegie Hall in New York, the Philharmonie in Berlin, and most recently at the Concertgebouw in Amsterdam. As a recording artist, Billboard Magazine recently named him “the global ambassador of Spanish guitar” after his latest solo album, Americano, quickly made its debut to the top 15 on their charts under the PIAS | Harmonia Mundi USA label. Pablo is now an exclusive Sony recording artist. Born in La Rioja in Northern Spain, Villegas was inspired to take guitar lessons at age six and gave his first performance at just seven years old. He went on to graduate at the top of his class at every school and university he attended. Over the years, he has garnered an impressive collection of more than 30 international awards, including the Segovia award which he won at age 15 and the coveted Gold Medal at the Inaugural Parkening International Guitar Competition. After receiving his Doctorate at the Manhattan School of Music, he has continued to live in New York City while traveling the world. After wrapping up a thriving 2015-2016 season, including a performance on a floating stage on the Amazon River with Plácido Domingo, the 2017-2018 season is taking Villegas to many new places, including his stop in Asheville. Villegas’ other concerts throughout the United States will include his debut at Chicago’s Grant Park Music Festival Orchestra at the Millennium Park in Chicago, Napa Valley’s Lincoln Center, and South Miami-Dade Cultural Center. He will also travel to Oslo, and be featured on the Norwegian Radio Orchestra, and to Orquesta de Minería in Mexico City. Villegas continuously searches for ways to communicate with young audiences and to inspire them with music. A born communicator, the guitarist explains: “Music is among things we cannot touch and that is what makes it most powerful.” Over the last decade, he has created projects that bring music beyond the performance halls, reaching more than 15,000 children and youth through volunteering his time, establishing music programs, visiting schools and creating unique community activities around the globe. His efforts have granted him invitations to play for both the Dalai Lama and the Spanish Royal Family. Pablo Sáinz Villegas’ October 3 performance at the Diana Wortham Theatre is made possible by Mainstage Music Series Sponsors Bank of America, JAG Construction, Merrill Lynch, Mosaic Realty, Signarama, Henry LaBrun, and Dianne & David Worley; with additional support from Media Sponsors The Laurel of Asheville magazine and BPR/WCQS 88.1 FM. For more information on the October 3, 2017 performance by Pablo Sáinz Villegas at the Diana Wortham Theatre (Regular $35; Student $30; Child $20; Student Rush, day-of-the-show with valid I.D. $10), call the theatre’s box office at (828) 257-4530 or visit www.dwtheatre.com. The owners of The Preserve, a private, natural sanctuary community in Madison County, are demonstrating their commitment to helping those in need in Western North Carolina with a grand opening to benefit MANNA FoodBank. The Preserve is already guaranteeing a $10,000 donation to MANNA—enough to provide the food for 35,000 meals for families in the region experiencing hunger. The new Equestrian Center will be unveiled at a grand opening event on Saturday, October 7, when the center hosts a $25,000 Grand Prix Calcutta. A calcutta is a form of skilled bidding on horse-and-rider teams in a live-auction setting where the auctioneer sells each team to the highest buyer. Bidders can be individuals, tables, or a group of friends. Top teams from across the Southeast will be participating, in addition to teams from Tryon, NC, and even international riders from as far as Brazil and Germany. The local impact of this event is powerful. All auction proceeds will benefit MANNA’s mission to end hunger in WNC, and because the food bank can provide 3.5 meals for every dollar donated, 35,000 more meals will be distributed into Madison County and across WNC. And that is before the auction has even started. In Madison County alone, more than 17 percent of residents live below the poverty line. In 2016, MANNA distributed over 679,000 pounds of food to Madison County, enough to provide over 565,000 meals. Across WNC, the food bank distributed over 16 million pounds of food, enough to provide over 13.7 million meals. The event will feature a Southern cuisine-inspired “Mountain to Table” menu by Brian Sonoskus, Executive Chef of the Star Diner and longtime chef of Tupelo Honey; an open bar showcasing craft cocktails and moonshine tasting by Troy and Sons Distillery; and live music from award-winning guitar duo Melonbelly. Tickets to the event are $100, and tables for eight are $2,000. Tickets can be purchase online at https://preservecommunities.com/launchparty/ or by calling 828-649-9424. Proceeds from the event will benefit MANNA FoodBank. Asheville Community Theatre (ACT) has been awarded a grant of $10,000 by the Perry N. Rudnick Endowment Fund of the Community Foundation of Henderson County. Asheville Community Theatre has completed the first phase of their Theatre Expansion and Renovation Project which included the renovation of the Mainstage Auditorium, dressing rooms and Green Room and significant upgrades to the lighting and sound system, with a hearing loop installed by Asheville Audiology Services. ACT is currently raising funds for Phase 2, the new construction of a black box theatre and the addition of an education complex with permanent classroom space. Asheville Community Theatre was founded in August 1946 and has served the children and adults of Western North Carolina through classes and camps, volunteer opportunities onstage and off, and hundreds of performances presented both on stage and across the region in schools, libraries, community centers, and retirement communities. In ACT’s 2015-16 season, more than 4,700 children participated in educational programming and 36,682 tickets were sold. McRae Hilliard is the President of the Board of Directors and Susan Harper is the Executive Director of Asheville Community Theatre. The Community Foundation of Henderson County supports charitable programs in the greater Henderson County area. It was founded in 1982 and administers over 500 funds with assets of over $80 million.